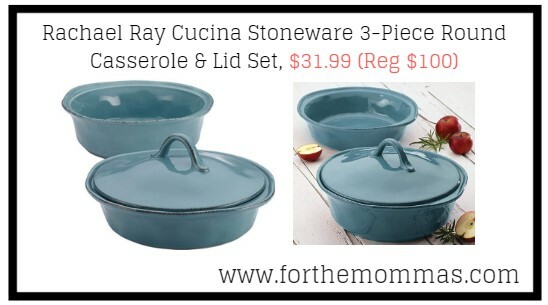 Amazon has Rachael Ray Cucina Stoneware 3-Piece Round Casserole & Lid Set, for $31.99 (Reg $100) with free shipping. The 1-1/2-quart and 2-quart round casseroles and lid are crafted from durable, solid stoneware and glazed with warm, earthy color. The stoneware baking dishes feature classic flared contours that incorporate comfortable, freeform handles. Oven safe to 500 degrees Fahrenheit, the casseroles are also microwave, freezer and dishwasher safe for convenience.